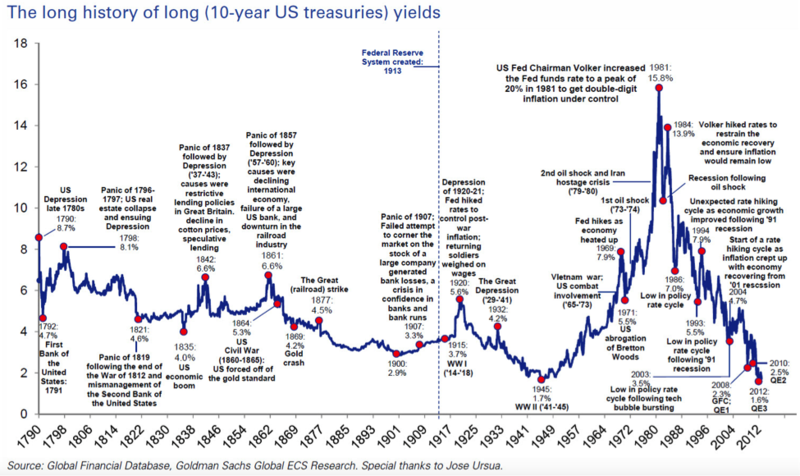 Will the interest rate peak of 1981 happen again? What is the interest rate risk over the next 20 years? As can be seen from the above graph interest rates have stayed under 8% over the 190 years prior to 1980. So what happened in the U.S. and world economy to cause the huge interest rate spike of the early 1980’s? In response to the previous 100 years of business cycle boom and bust Congress passed the Federal Reserve Act in 1913. The Federal Reserve System was created as a mechanism to centrally manage the economy of the U.S. As the central bank, the Fed maintains a large reserve which allows it to loan money to individual banks so they can maintain their liquidity. The Fed charges the banks interest on the money that they borrow. This is called the discount rate. The Fed uses the discount rate to control inflation. When the interest rate is higher than the inflation rate, money from the economy flows into bonds and savings accounts which decreases the cash in the economy. The cost of borrowing funds to purchase goods becomes greater than the increase in value of the goods caused by inflation. So the borrowing of money to purchase goods declines therefor the demand for credit declines so interest rates decline. When the interest rate is lower than the inflation rate money from the economy flows into the purchase of hard goods and property which fuels the inflation spiral. The Fed tries to maintain an inflation rate of about 3% to 4% by raising and lowering the discount rate. In the 1920’s the Fed began an additional mechanism to control the interest rates through their open market operations. By purchasing or selling securities in the open market, the Fed is able to control the amount of currency in circulation and thereby controlling the inflation rate and interest rates. After World War II, congress passed the Employment Act which added the goal of promoting maximum employment to the list of the Fed’s responsibilities. To maintain full employment the Fed tries to maintain a reasonable inflation rate of 3 to 4 percent. With the end of WWII the returning soldiers with their back pay provided an infusion of cash into the economy and the inflation rate started moving up. In the 50’s The Korean War added fuel to the inflation rate as the government pumped cash into the economy for the purchase of war material. The same occurred again in the 60’s during the Vietnam War. The Fed took action to cool the economy in 1969 by raising the discount rate to 7.9%. Prior to the Fed’s action the inflation rate was 5.9%. This action caused the interest rates to decline rapidly and the inflation rate to decline slowly back down to 4.4% in 1971. Toward the end of WWII the Allied Nations met at Bretton Woods in New Hampshire to hammer out fiscal policies and agreements that would facilitate the reconstruction of Europe. One of the agreements was that the U.S. dollar would be pegged to $35 per troy ounce of gold and all other currencies would be pegged to the dollar. As part of the deal, all Allied nations would maintain their reserves in U.S. Dollars with a tacit agreement that they would not demand the gold held by the U.S. that was backing the dollar, and sell the gold on the open market. In the late 60’s the price of gold on the open market was higher than $35 per troy ounce and the U.S. started to see a significant drain on its gold reserves as these nations started exchanging their reserves for gold. So in 1971 the U.S. withdrew from the Bretton Woods agreement and took the U.S. Dollar off the gold reserve. This action plus the increased spending on the Vietnam War and the spending on President Johnson’s Great Society programs caused the inflation rate and the interest rate to again increase. And then came two events that the U.S. and the rest of the world economy was not prepared for. The OPEC nations who controlled the majority of the world’s oil production, decided to create a shortage to increase the price of oil; supply and demand principals at work. So in 1973, and again in 1979, OPEC embargoed oil on the world market and inflation took off causing interest rates to increase. This inflation was unique. Oil is a basic commodity in an industrialized society. The increase in the price of oil from less than $20 per barrel to over $100 per barrel meant that the price of all goods in the world economy increased rapidly, not because of supply and demand principals of too much cash chasing too few goods, but because the base cost of transportation and manufacturing increased by 500% in a very short period of time. The short time frame did not allow the economy to adjust and absorb the increase in the cost of goods. Instead it resulted in companies going out of business or cutting back which caused unemployment to increase rapidly. This phenomenon is called stagflation. This put the Fed in a quandary. If they raised interest rates they would exacerbate the unemployment problem and if they did not they would exacerbate the interest rate problem. Adding to this was the 1933 Glass-Steagall Act that prohibited banks from paying interest on demand deposits (checking accounts). Glass-Steagall also imposed maximum rates of interest on various other types of bank deposits, such as savings and NOW account. This was called Regulation Q of Glass-Steagall. The motivation for the deposit interest restrictions was the perception that the bank failures of the early 1930’s, during the first part of the Great Depression, had been caused in part by excessive bank competition for deposit funds. This competition resulted in the narrowing of the profit margin between lending rates and borrowing rates. The belief was that this encouraged overly speculative investment behavior on the part of large banks. The ceiling rate on savings deposits in the late 70’s was 5.5%. Wall Street, in response to the rising interest rates, created Money Market accounts. These accounts were unregulated and could pay competitive interest rates causing an outflow of funds from banks into these unregulated accounts. In response, Congress passed the Monetary Control Act in 1980 to phase out the regulation of bank interest rates over a period of six years. This act resulted in an interest rate war among the banks and between the banks and Wall Street for these deposits. The dramatic spike in inflation and interest rates was finally quashed by the Fed in 1981. The Fed raised the discount rate to 20%. This was 6.5% higher than the inflation rate in December of 1980 and 4.5% higher than the long term interest rate. This action immediately cooled the economy and created a recession. As the economy came out of the recession in 1985 and 1986 inflation and interest rates again heated up and the fed again raised interest rates above the inflation and long term rates to cool the economy. All of this adds up to a perfect storm of government spending on war material and social programs, coupled with a dramatic increase in the cost of a basic economic necessity and the deregulation of the U.S. banking industry. Can and will the interest rate spike of 1980-81 occur again or will we chug along with interest rates closer to the long term historical 5% average. War spending, Iraq for instance, or other future local conflict will still occur and war material spending by the government will put upward pressure on inflation but these by themselves are manageable as the chart indicates. Social program spending by the government will continue and will increase as the baby boomers come of retirement age, but again, this pressure is manageable. The wild card is an unforeseeable rapid increase in an essential base commodity such as oil. It has taken several years for the U.S. and world economy to absorb the higher oil prices and to stabilize. The U.S. and the other developed countries in the world have taken steps over the last 30 years to diffuse the power of OPEC or any other block of energy producing countries to impose embargos and manipulate the price of oil. The U.S. now has a large emergency oil reserve. The production of oil from the oil sands in Canada and from the oil shale in the west coupled with the boom in fracking to produce natural gas has made the U.S. a net exporter of energy. Additionally the government keeps raising the CAFÉ standards which reduce the demand for gasoline as does the production of battery and hybrid cars. The expansion of green energy solutions for electricity at home and abroad is decreasing the demand for oil. So it looks like the world has taken the necessary actions to protect their economies from the oil producing countries and it is unlikely that the kind of oil shock that the world experienced will happen again. Are there other base commodities that could cause such a spike? Perhaps water and food are such commodities. The world’s water reserves in the major aquafers are being depleted for the production of food and alcohol for fuel. This depletion, however, is gradual which allows the economy to absorb the rising prices and for technology to provide alternative solutions. Are there entities that control the majority of the production of these or other base commodities that could embargo those commodities for political or economic reasons and cause a rapid increase in prices? As the world moves toward a more electronic world, some have suggested that China may have such power. China currently controls the majority of know rare earth reserves that are required for our electronic devices. However, this would not have the same impact as oil because is a consumable commodity that needs to constantly replenished. In conclusion, it is very difficult to identify a base commodity controlled by one or more entities that have the power to embargo that commodity and cause a repeat of the stagflation of 1973-81. Additionally the Fed, as well as the other central banks in the world, has learned their lesson from the oil embargo.